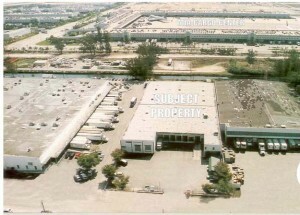 Redlich Negotiates Lease for 55,000 square foot Miami Warehouse!!! July 2003 – Edward J. Redlich, Vice-President of ComReal Miami, Inc., has successfully negotiated two simultaneous transactions for a large industrial building in Miami Airport West. Ed Redlich was first retained by Fashion Marketing International (FMI), a national trucking company, to sub-lease their excess space at 1855 NW 70th Avenue in Miami, Florida. The property consists of a 55,000 sq. ft. warehouse on 2 acres. Marketing efforts procured Gate Gourmet, one of the largest airline caterers in the country. They needed to secure a new location immediately because their former facility was placed under eminent domain for Miami International Airport’s expansion. The landlord, Faith Freight Forwarding, negotiated the buyout of the existing lease with FMI while simultaneously creating a new lease with Gate Gourmet. “I believe that all three parties benefited: FMI reduced their lease obligations in half; Gate Gourmet acquired a facility that best suits their needs; and Faith secured a credit tenant with a long term lease.” – states Ed. Faith Freight Forwarding was very pleased with the industrial Realtor’s performance: “His expertise in the market allowed us to negotiate a very competitive rental rate as well as help us overcome obstacles during the negotiation process that were impeding the completion of the agreement.” FMI was also very satisfied with Redlich’s results: “His efforts allowed FMI to focus more on it’s Miami operations rather than maintaining real estate.” – says John Kurowski, VP.